On Aug. 13, like every finals night, 12 corps will go out and accomplish some very hard routines at a very high level and will it make it all look easy. I remember when I was first introduced to the activity, I was very impressed and thought that I would never be able to accomplish such things. Everyone will remember the great moments that happen on that night, but it's the journey up to that point that really matters. That journey to finals night in Providence, R.I., began on Nov. 26, 2004, for me. But the journey continued this past weekend in Fremont, Calif., when we started to learn drill. Friday morning I got into San Jose International at the usual 10:20, and thanks to Christine Morrow, who picked us up, several other members and I headed over to the corps hall. Once there, I had the chance to hang out with SCV general manager Dan Vannatta and check out what really goes on behind the scenes with the corps. This encounter really helped me make a decision to pursue a degree in business with a minor in music. In expectation of warm weather in California, I wore a pair of shorts and a short-sleeved shirt. Something I neglected to even think about those was that fact that once the sun goes down, it gets very cold outside. Friday night we blocked off a street and had full ensemble outside, which was much better than most Saturday nights, when we have it in a gym with a domed roof. After rehearsal we loaded the sisters and headed off to Fremont, where we were to have camp. After a great snack, lights out commenced. Saturday morning the great Stuart Shulman woke us up to sunny warm weather. After breakfast and stretching, the corps headed out to the field where we had a short basics block, then it was on to the much-anticipated learning of drill. It's always been a dream of mine to march a Myron Rosander drill, and to just march with the Vanguard in general. Now I'm truly living that dream, and it's almost crazy to think about everything that has happened in the past few months. In February I wrote that I was an alternate for the Santa Clara mellophone line. 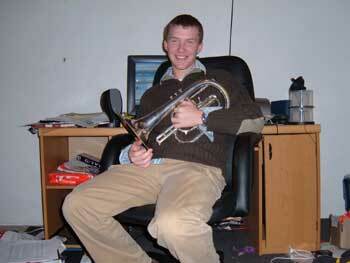 Now, after being consistent, I was told that I am now a marching member on mellophone for the 2005 season. Let me tell you, I was beyond excited about finding this out. We spent the entire morning block learning drill. Paul Brakewell, the british mellophone player, insists that one of our sets is a tribute to him, since he will be aging out this summer. On Saturday we learned the drill for movement one of Shostakovich's Symphony number 12. Then after lunch, we started to put the music to the drill. This is definitely the most challenging drill I've ever had to march and play; it will be a great summer for sure. During the afternoon block I was pulled out to be fitted for the uniform. I was very excited to actually get to put the uniform on. Part of the reason I love drum corps is because when I put the uniform on, I feel almost invincible, and part of something so great that it cannot be stopped by any force. Since I'm short, they have to hem the pants up a bit, surprise, surprise. Part of the fitting also includes finding the aussie that fits perfectly. My marching career has always consisted of me wearing a shako, so this was definitely a new experience. Sunday morning, after seven hours of sleep, Stuart woke us all up. I must say I wish daylight savings time would have happened on a different weekend. I found it a little bit of a challenge to get off of my air mattress because of the stiffness my body was becoming reacquainted with. After another stretch, we headed back to the field. After a review of movement one, we moved on to learn the drill for movement two. After what seemed like a very short time, we moved over to the end zone to warm up as a horn line. After a short warmup, we moved back onto the field to march and play all of what we learned throughout the weekend. I have to admit that I can't remember ever accomplishing this much before. I'm extremely excited that we have the first two movements on the field. Next camp, the guard will join us, and we will be a full corps again, after four camps without them. Before we all know it, move-in will be upon us, and then only a short while later it will be finals night. This season is already flying by.